These cookies are seriously amazing. You can't even tell it is vegan... this coming from a diehard cookie fan who isn't just yet giving up eggs and dairy in cakes. Maybe someday ... just not today. But this was really awesome. You really don't need any eggs here, and as for the butter, hey, you have peanut butter. 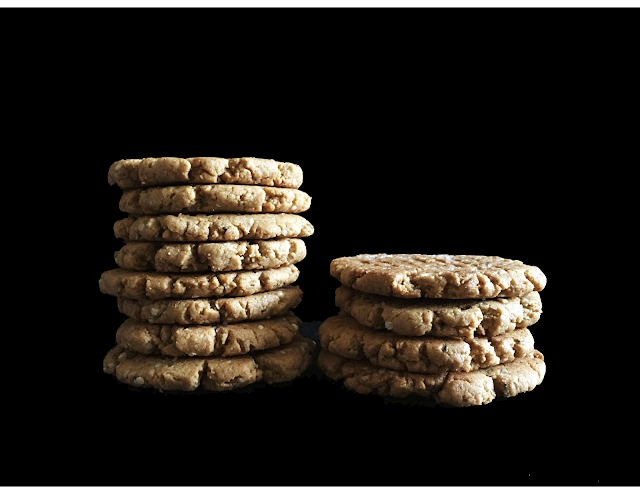 So that means you can just about make this an almond butter cookie, a nut butter cookie, or a seed butter cookie. How nice is that? Whatever you do, please don't forego the salt on this one. It adds heaps of flavour (only because my PB was unsalted), and an unexpected burst on the tongue as you bite into it. And then as if to offset the guilty pleasure of it being salted, I added hemp hearts into the mix. Optional of course, but I can't resist the urge to add more goodness to any baked good. Flaxseed meal, hemp hearts, chia seeds, pumpkin seeds ... got a special stash of what I call 'add-ons' which are liberally thrown into not only cookies, loaves and muffins, but even curries and stir fries as well. Make this a habit. It's a good one. Since I like cookies thin and slightly crispy, I turned them over at the 6 minute mark and that's why they look 'flattened out'. LOL! 1. Preheat the oven to 175C or 350F. Line two baking sheet with parchment paper and set aside. 2. Cream the peanut butter and brown sugar until light and pale in colour. 3. In a medium bowl, whisk together the flour, hemp hearts, baking soda, and pinch of salt. 4. Reduce the speed and add the vanilla. 5. Fold in the flour in three additions. It's going to start clumping up. 6. Introduce the nut milk a few tablespoons at a time to get the mixture into a cookie dough consistency. 7. With an ice cream scooper, shape the dough into balls, then roll slightly in your moist hands, and flatten them into discs. 8. 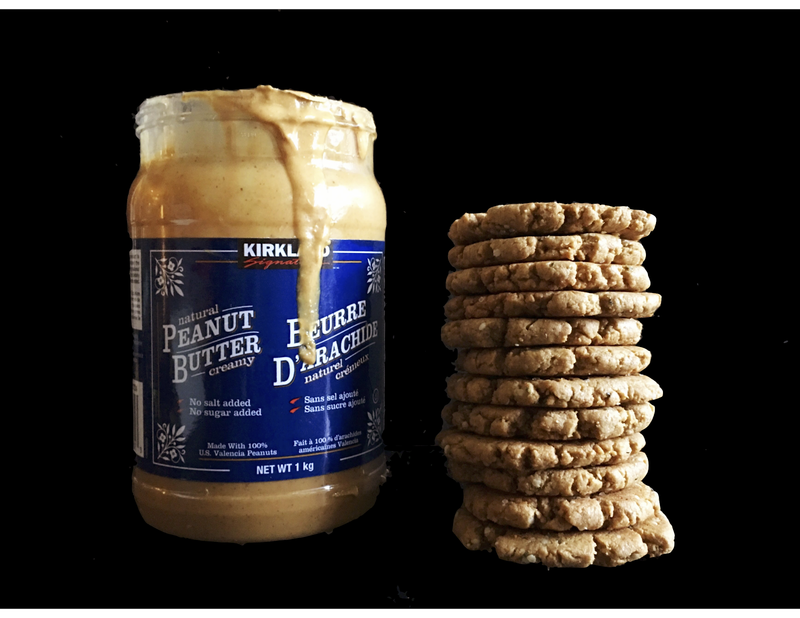 Using a fork, make the trademark peanut butter cookie stripes on the top of the cookie. 9. Sprinkle the top with a bit of Himalayan pink salt flakes. 10. Bake in the preheated oven (on the middle or top rack) for 8-10 minutes until golden. Enjoy with the nut milk of your choice.